OK. You've just washed your car and it looks great BUT couldn't you do a little more? How about waxing it? Takes too long? Not now! Before you even dry it off you can lay down a booster layer of synthetics (we love to call them "Sealants") which will add to your previously applied wax layer for a longer lasting shine. And what better to use than a sealant which way outlasts any wax? If you like the NXT Tech Wax G12718 and/or the Mirror Glaze M21 shine and longevity, you can boost it every time you wash - or in between washes. It applies wet or dry; rain ro shine; hot or cold; paint, glass, trim or metal. This spray wax does it all! Now, for a truely long lasting protection you'll still need the sealant of your choice but this item will extend it's life if used regularily. Finally, frequent applications of a full protective coating can build up over time. Thinner frequent layers avoid that problem. 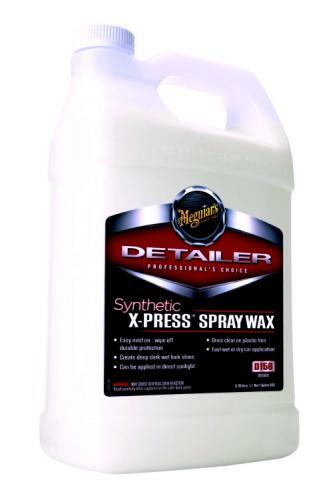 Meguiar's® Synthetic X-Press™ Spray Wax uses a unique blend of Hydrophobic Polymer Technology™ to produce durable deep rich gloss with easy application and instant wipe off. VOC FREE Formula. Shake Well. For best results apply to clean surface. Mist product onto one section at a time. Quickly spread product with a clean Detailing Cloth and immediately wipe with a second dry Detailing Cloth. Do not allow to dry on the surface. May be applied to a wet vehicle after rinsing. Mist on wet car and proceed with drying towel/chamois. Apply to paint, glass and chrome for durable hydrophobic protection. Also great on painted wheels.